When the utility’s grid goes down, it is still business as usual for those with Photovoltaic (PV) systems with battery storage. This system is Grid Tied and Net Metered, using a battery based inverter system to process the energy. 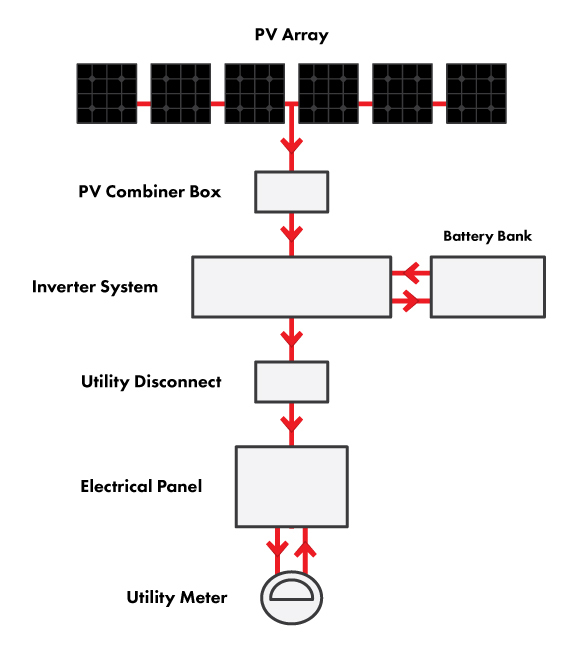 A group or array of PV panels are connected together in groups or strings, usually 3 panels. These strings or groups are all connected together in a Combiner Box which is located near the Array. The DC electricity from the PV panels flows through Combiner Box to a Controller/Regulator in the Inverter system. The Controller regulates the DC power to the batteries. The Inverter allows the batteries to charge and, once the batteries are full, it converts the extra energy from the PV array to AC electricity (which is normal household power). The AC electricity then goes to a safety switch for the utility located outside and near the power meter. From there, it goes to the main electrical panel. Once in the electrical panel, the electricity is used by the loads connected to the panel for lights or appliances. Any extra electricity that is not used in the panel is pushed out or “sold” to the utility grid. New electronic power meters that read power flow coming and going track the energy sold to the utility. Here in Nova Scotia we have a Net Metering program that allows people to sell power to the utility, Nova Scotia Power Inc.
500 watts to 10,000 watts Larger commercial systems available. Panels can be 100 meters from Inverter. Inverter System located in utility area. Power available during grid outage. Battery maintenance and lifecycle costs. "Solar power has provided us with an efficient and dependable power source while living off the grid on Pictou Island. Accolades go to Mr. Robert MacKean at Nova Sun Power for technical advice and professional installation of the solar powered system in our home. We are planning to add to our system in the near future and Nova Sun Power is the place to do business! We take pleasure in recommending Bob for your future solar power requirements."